Forty-five community volunteers participated in citizen science monitoring on May 5 by examining and recording plant and animal species found in Onondaga Lake’s restored wetlands. During the event, volunteers identified nearly 80 species, including 30 bird species. Notable species included bald eagle, sora, snowy egret, Northern shoveler, yellow perch, and muskrat. The event was hosted by the Onondaga Lake Conservation Corps in partnership with the Central New York Chapter of the Izaak Walton League of America’s Young Naturalists Leadership Team. It offered community members the opportunity to observe firsthand Onondaga Lake’s most recent habitat improvements. Left: 14-year-old Nolan Gryzlo, of Skaneateles, New York, monitors water quality with assistance from Young Naturalists Leadership Team member Saadiya Sheekh-Nuur. Right: Mike Serviss, Young Naturalists Leadership Team member, identifies vegetation at Geddes Brook wetlands. Volunteers worked with the Young Naturalists Leadership Team and habitat experts from Onondaga Audubon Society, OBG, and Parsons to explore and inventory the abundant plant and animal life found in restored wetlands at Geddes Brook and along Onondaga Lake’s southwest and western shorelines. Left: Matt McDonough (left) and Jesse Carr, Parsons habitat experts, use a seine net to catch and identify fish. 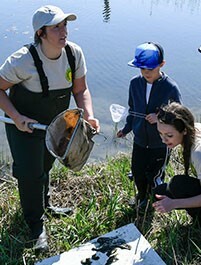 Right: Candace Schermerhorn, Young Naturalists Leadership Team member, nets aquatic species at Geddes Brook wetlands. The observations are being compiled with data collected by wetland ecologists to understand conditions of recently restored areas in the watershed. On the shores of Onondaga Lake and along the lake’s tributaries, Honeywell has improved nearly 90 acres of wetlands, and is planting about 1.1 million plants, trees, and shrubs. Since the formation of the Corps, 20 events have brought together more than 800 volunteers who have become environmental stewards and Corps members. In recognition of their work, the Onondaga Lake Conservation Corps was awarded a U.S. Environmental Protection Agency 2015 Environmental Champion Award. The Corps is an expanding organization of volunteers who are contributing to restoration projects that are creating or improving wildlife habitat in the Onondaga Lake watershed. It was created to inspire future stewards of Onondaga Lake through a hands-on, experience-based program that offers citizens and organizations the opportunity to participate in activities that help restore and sustain Onondaga Lake and its value as an Important Bird Area. The Corps was founded in 2012 by Honeywell in partnership with Montezuma Audubon Center and Onondaga Audubon Society. Additional Corps supporters include Anchor QEA, Audubon New York, Bond Schoeneck & King, Habitat Gardening in Central New York, OBG, Parsons and State University of New York College of Environmental Science and Forestry. To learn more about the Onondaga Lake Conservation Corps, visit http://ny.audubon.org/OLCC, www.facebook.com/onondagalakecc or www.youtube.com/onondagalakecc. For more information on the Onondaga Lake cleanup, visit www.lakecleanup.com. View more photographs of the Onondaga Lake Conservation Corps.